This article is about a settlement in northern Slovenia. For the castle with this name, see Koprivnik Castle. 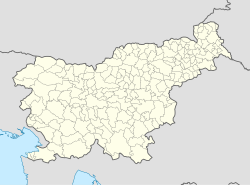 Vranja Peč (pronounced [ˈwɾaːnja ˈpeːtʃ]; German: Rabensberg) is a small settlement in the hills above the Tuhinj Valley in the Municipality of Kamnik in the Upper Carniola region of Slovenia. The parish church in the settlement is dedicated to Saint Ulrich. ^ Leksikon občin kraljestev in dežel zastopanih v državnem zboru, vol. 6: Kranjsko. 1906. Vienna: C. Kr. Dvorna in Državna Tiskarna, p. 28. This page was last edited on 13 May 2017, at 16:26 (UTC).